Most people don't always have the time to go out for a three to four-day carp fishing session. My brother and I mostly do short morning or evening sessions. Well, this recent session was no different. My brother and I have decided to go for a quick day session at our new club waters. We had our rods in at around 7:30am; targeting a spot we pre-baited the day before with boilies and some hemp. The morning went on, and I missed my first catch. Just as I finished casting the rod and set the drags, my second rod went off and I managed to land a small 5kg carp. 20 minutes later my brother’s rod went screaming, and he caught a 6kg carp. A good two hours went by, and as we discussed our new re-baiting strategy, my rod started to scream again. I struggled to land the carp – it decided to head towards a weedy patch just 20-metres in front of me. After a lot of patience and taking real care, I managed to let the carp swim free again. My catch weighed in at 6.86kg, caught on a Snowman Rig in 1.4m deep water. My brother then landed his 7.42kg as we were packing our gear. 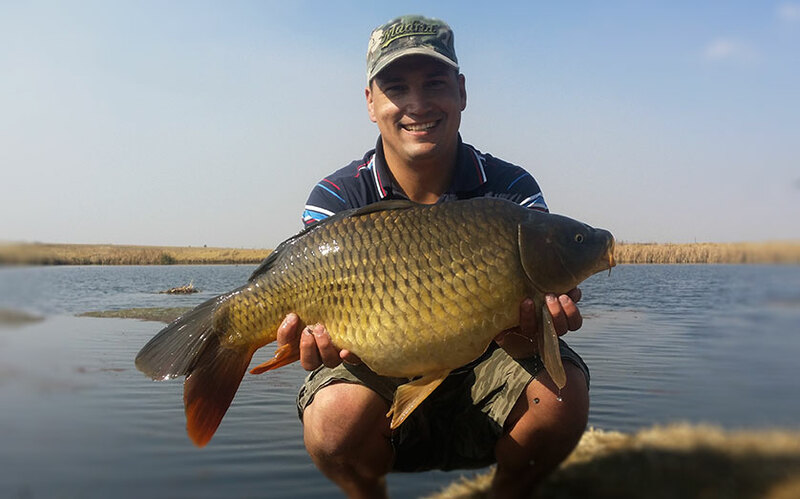 In the six-hour session, we managed to land five carp and lost two – a great day of fishing for us.